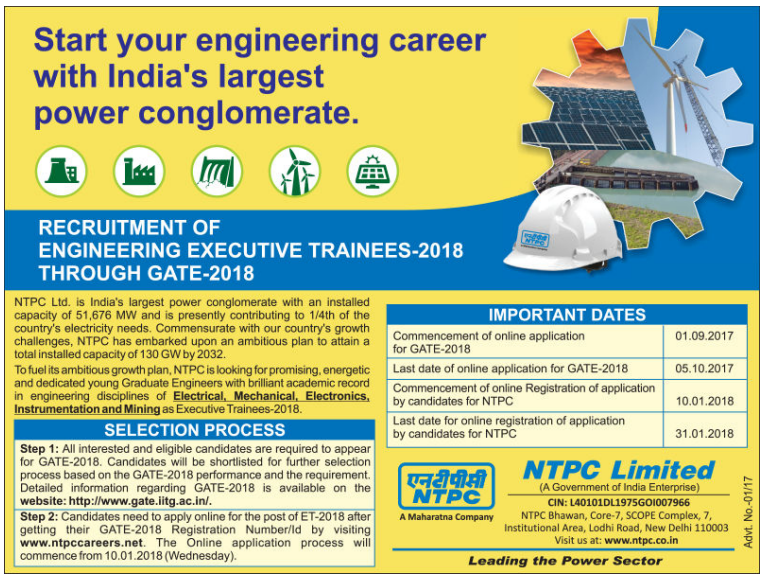 NTPC Recruitment scheduled for Executive Trainees for Engineering graduates.The detailed eligibility and application process are given below. Full time Bachelor’s Degree in Engineering or Technology/AMIE with not less than 65% marks, taking average of all the Years, irrespective of the weightage given to any particular year by the Institute/University. Final year/semester students are also eligible however they have to obtain at least 65% marks in their engineering degree. Eligible candidates will have to appear for Graduate Aptitude Test in Engineering (GATE)-2018. Based on the GATE-2018 marks and requirement, candidates will be short listed for appearing in Online Aptitude Test, which is only qualifying in nature. Based on performance in Aptitude test, candidates will be further shortlisted for Group Discussion and Personal Interview. Candidates need to secure minimum qualifying marks each in Group Discussion and Interview separately, before being considered in the merit list. The final merit list will be prepared based on 85% weightage of GATE-2018 marks, 5% weightage of GD marks and 10% weightage of Interview marks. Please note that for ET-2018 recruitment, GATE scores of 2018 will only be valid. How to Apply NTPC Recruitment?